When I eat an ear of corn, I eat an ear of corn. I don't mess around. I go into beaver mode and chisel away at the thing row by row until every kernel is gone. Yes, this often results in corn mush all over my face, but it's worth it. My grandfather and little brother share this slightly obsessive trait with me. My grandpa grows all kinds of corn in his garden, and I'm bummed that I'll be missing out on it this year. Boy, I've been spoiled by that man's garden. And speaking of Little Bro, I'm thrilled to report that he'll be making a move to Pennsylvania soon and starting a doctorate program at Penn State. Yes, he'll be making the switch from Hokie to Nittany Lion, whatever that is. Sidenote: I went from Maroon to Hokie. What the heck is up with these vague mascots? Anyway, LB'll be about six hours closer to me, so instead of being 700 miles away from my family, I'll have one member right down the road--only a measly 350 miles away. Hooray! High five. That is the only way to eat corn. Great thing to be sitting on the picnic table chowing away not caring where the kernels that get away landed (especially for an OCD kitchen/dining room cleaner like myself). Ahh...how I love spring-fall. My family has always commented on how clean my ear of corn is when I'm finished with it. I believe in no kernel left behind! I just bought a beautiful pack of bi-color corn yesterday and I can't wait to get some typewriter action goin on them. I need to round some corn up at the famer's market this weekend. So glad you eat your corn row by row, rather than going around in circles. I can't wait for fresh corn! And don't you love it when it's all stuck in your teeth and not even the Glide floss can remove all the crap? That's how you know it was really good. oh yeah baby. you have to eat corn that way or it's not fun! My kinda gal - corn is made for two things - eating it like a savage and feeding it to the livestock :)...well, maybe more than two things but you've got the right idea. Oooh my dear Lord above. 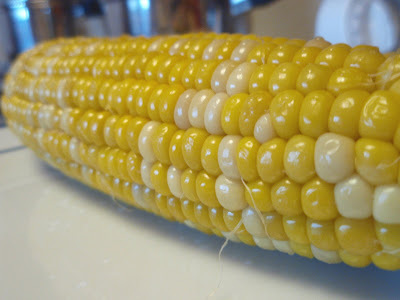 Bi-color corn is one of the best foods on the planet. Oh how I miss Minnesota right about now. Of course, the corn won't be ready until July there, but still. I miss those sweet juicy little kernels of heaven! Wow, you are a machine. I always end up with half bits and pieces all over the place. There is nothing better than sweet juicy corn on the cob, dripping with melted butter, lime juice and pepper. Or maybe it's just me. Now I am craving a nice cob of corn! I eat my corn by picking each kernel off with my fingers at a time, which means it takes forever for me to eat one ear of corn. Lon always watches me in fascination. What a gal. My husband’s mother always cut the kernels off the cob for her kids. So now my darlings want it cut off. I refuse. I eat it just like you do, always have, alway will (unless I lose all of my teeth)! My grandmother used to say, "I could eat my length in corn on the cob" and then prove it. Is there anything better? You really are a squirrel. Looks so good...can't wait to roast some corn on the grill this year! I couldn't agree with you more. 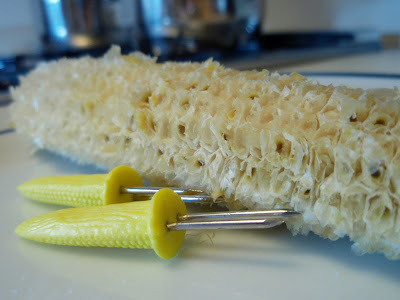 This is the only way to eat corn on the cob. Like an utter slop. And yes, it is so, so worth it. Sounds like you eat corn the same way I do!